Hillmer, Norman. "Patriation: The Canadian Constitution Comes Home". The Canadian Encyclopedia, 25 January 2019, Historica Canada. https://www.thecanadianencyclopedia.ca/en/article/patriation-the-constitution-comes-home-feature. Accessed 22 April 2019. A Canadian-made constitution was unfinished business from the country's colonial past. The British North America Act, which set out the jurisdictions of the federal and provincial governments, accompanied the creation of Canada in 1867. It was, however, a law of the London Parliament, and it could only be amended by the British. Governments had been attempting to bring the BNA Act home ever since the period between the First and Second World Wars, when Canada emerged from the cocoon of the British Empire. It was unacceptable, insisted Prime Minister Pierre Trudeau, to travel "cap in hand to a foreign government" every time that Canada wanted to change its founding document. A celebration of the 1982 constitution was scheduled for the stuffy Senate Chamber of the Parliament Buildings. It was moved outside at the last minute to Parliament Hill, taking advantage of what reporter John Gray called the world's largest television studio. 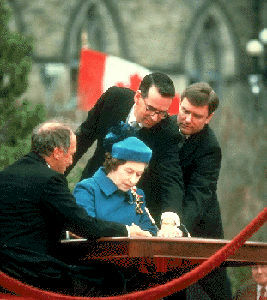 At precisely 11.37 a.m. on Saturday, April 17, with trumpets blaring, a tuxedoed Pierre Trudeau invited the turquoise-costumed Queen to leave her makeshift throne to inscribe "Elizabeth R" on the royal proclamation of the constitution, which had been written out in elegant script on paper manufactured from Manitoba flax. Queen Elizabeth II signing the Constitution document as Prime Minister Pierre Trudeau and his aides look on, Ottawa (courtesy Statistical Society of Canada). Organizers expected 100 000 spectators to attend the ceremony, but the prospect of bad weather kept the numbers down. Just as the Queen stepped up to speak to a crowd estimated at 32 000, the rain and hail began to pour down, sending umbrellas skywards and VIPs scurrying. Much of what she had to say could not be heard. For the English Canadian media, it did not seem to matter. The constitution was a triumph, and the signing of it a grand, almost giddy, moment. "3 Cheers for Canada," exclaimed the Toronto Star. Quebec Premier René Lévesque marked the day in another way, heading a Montreal protest march against the constitution. He insisted that the Queen had been imported to put a bright face on mediocrity. Trudeau and Lévesque had been the central protagonists in the eighteen-month battle that led to April 17. The federalist and the separatist were classic adversaries: articulate, charismatic politicians with rock-ribbed convictions, crusading mentalities and convinced followers. Trudeau had won the 1980 Quebec sovereignty referendum, promising constitutional renewal and vowing that "we will not stop until we have done that." He immediately proposed the "patriation" (a word invented for the purpose) of the BNA Act with an amending formula and a Charter spelling out the rights and freedoms of Canadians. A September 1980 First Ministers conference, pitting a bellicose Trudeau against Lévesque and the majority of the premiers, ended in disarray. "I'm telling you now, Trudeau responded, "we're going to do it alone." He threatened a resolution from the Canadian Parliament asking the British to pass the necessary legislation without the consent of the provinces. The Supreme Court of Canada ruled that Trudeau had the legal power to proceed unilaterally, but that it would go against history and practice to do so. That opinion, rendered against the background of the powerful feelings that were being expressed on both sides of the constitutional divide, nicely balanced what was possible and what was right. Trudeau decided to try one last time for consensus, bringing the premiers to Ottawa for four days in November 1981. He was able to isolate Lévesque, or perhaps Lévesque isolated himself, and the anti-Trudeau coalition broke apart. While the Quebec leader slept, his former allies negotiated a compromise with Justice Minister Jean Chrétien. The deal was presented as a fait accompli to Lévesque at breakfast the next morning. He left Ottawa humiliated and embittered. The constitution was brought home, and home would never be the same again. Quebec felt betrayed, a wound difficult to heal. The Charter of Rights and Freedoms revolutionized the Canadian legal system, dramatically increasing the powers of the courts in the arena of individual rights and social values. Frédéric Bastien, The Battle of London: Trudeau, Thatcher, and the Fight for Canada's Constitution, trans. by Jacob Homel (Dundurn, 2014); Ron Graham, The Last Act: Pierre Trudeau, the Gang of Eight, and the Fight for Canada (2011); Howard Leeson, The Patriation Minutes (2011).